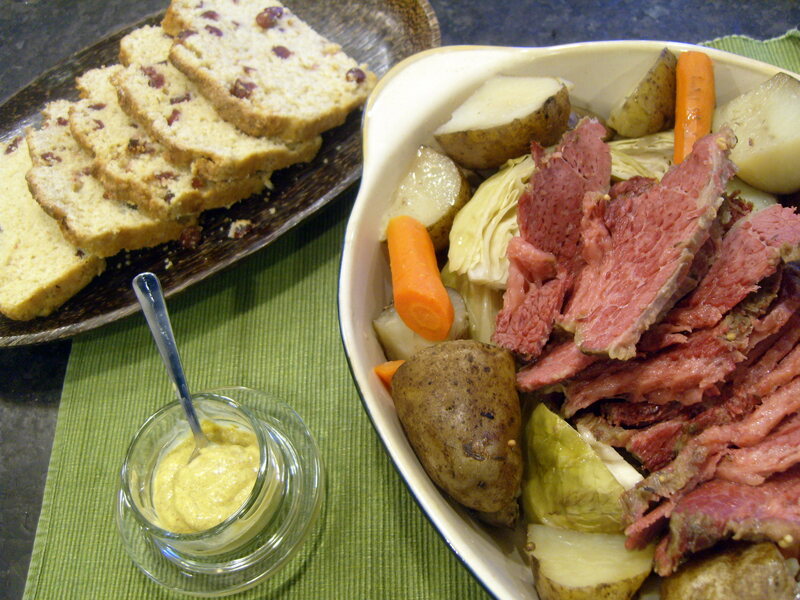 Until a couple of years ago, I had never tried corned beef, and sort of assumed I wouldn’t like it. But one St. Patrick’s Day, my husband requested it, so I gave it a try. Turns out, I do like it, and it’s not difficult to make. The kids aren’t really fans (they’ll eat three bites and then fill up on soda bread), so this year I bought a very small piece of corned beef. There should still be enough leftovers for a couple sandwiches or maybe some corned beef hash for Sunday brunch. I didn’t reinvent anything here, but this is the recipe I’ve used and and enjoyed. I always use the slow cooker, though, for eight hours on low. And this year we’re going to roast the cabbage to go alongside. We like roasted anything better than the steamed version. What to do with all that extra cabbage? If I cooked the whole head, we’d run out of corned beef long before we finish the cabbage. Melissa Clark gave three great recipe suggestions in her latest New York Times column. I may try all three (I bet the kids will even eat the pasta), and save a little cabbage to go with fish tacos next week. We love our fish tacos! By the way, I thought I’d share my favorite cookbook of the moment: Melissa Clark’s Cook This Now:120 Easy and Delectable Dishes You Can’t Wait to Make. Almost every recipe is simple enough for a busy weeknight, but both comforting and full of interesting flavors at the same time. Between our collection of 20-some years’ worth of cooking magazines, several shelves groaning under the weight of cookbooks, and millions of recipes on the Internet, I’m now very selective before buying a new cookbook. I like to try before I buy, so I checked this one out of the library. After making half a dozen dishes (carefully avoiding splatters on the library book), and many more I wanted to try, I plunked down the Amazon gift card I’d been hoarding and bought my own copy. This book would also make a wonderful wedding or housewarming gift for any cook, novice or experienced. Do you celebrate St. Patrick’s Day? Green beer, anyone? You might try making Colcannon…it’s cabbage and mashed potatoes. It is a good way to get kids to eat their vegetables. I just posted how to make it on my blog if you care to stop by. Have a Happy St. Patrick’s Day. Your vegetable puree sounds delicious. It’s definitely hard getting children to eat new things. Great to see the influence of our little island spreading across the globe, even if it is only for one day a year. Happy St. Patrick’s Day from Dublin, Ireland.